It’s amazing what we collect over our lifetime. Thoughts, beliefs, commitments, todos, just to name a few. One of things we collect that has incredible value are the lessons we learn. 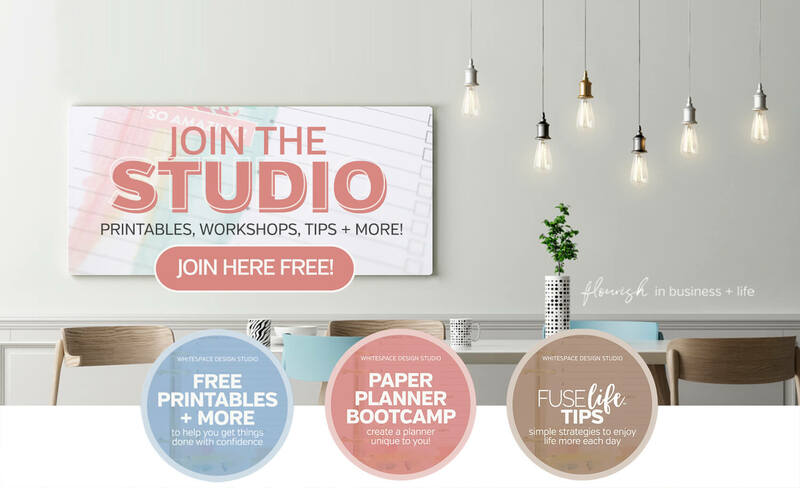 Today we’re diving into 6 ingredients from lessons I’ve learnt that can help you better plan + organise your business and life. I don’t know about you, but does life feel like it’s in a state of constant change? This year has been especially so for me. I don’t know if it’s always been that way, or whether it’s just an effect of the pace of society today. Admittedly, there had been quite a few things on the go and toward the middle of the year I’d collected more than me + my schedule could contain. A recent pause from doing ‘all the things’ gave me the space + time needed to reflect, and where needed, re-learn, these 6 valuable lessons. I believe these six lessons, show us some essential ingredients we need to better plan + organise our day. A good life doesn’t just happen. It’s a compilation of our everyday decisions over time, in amongst the hustle + bustle of life. And if you don’t have a way to plan your day, it’s easy to get caught up in the daily doing, making deadlines + checking off our lists. Even though I enjoy my work. I want to make sure I’m there for my family, not just in body but heart + mind too. To be part of their day, sharing their wins, supporting them though the challenges, and encouraging them to be their best. So how do we get so busy with the “got to do’s” that life feels like a game of whack-a-mole? So busy managing the day to day, that we don’t enjoy life like we could. The message in Ecclesiastes is clear, to honour God + enjoy life. In particular verses 12 + 13 in chapter 3 talk about how enjoying life is a blessing from God. Now that’s one blessing I don’t want to be too busy for. What’s on your most matters list? And how can you ensure it is part of your everyday? I think these 6 ingredients can help you enjoy life more and ensure that you’re not too busy ‘doing’ that you miss what matters most. Make these six ingredients part of the way you plan + organise your business + life, you can reduce the overwhelm, live in the moment, and do a whole lot more of what matters. What we think about can be one of the greatest challenges or advantages to succeeding in business + life. Proverbs reveals that as a man thinks in his heart so is he. What have you been thinking about today? How would you say it’s affected your mood, attitude, ability to focus? It sure makes me want to know what I’m thinking about. Ask yourself : Am I helping or hindering myself with what I’m thinking? The simplest way I’ve found to become more mindful of your thoughts + uncover what’s fuelling your activity is to journal each day. Buffer and white space are two other names for margin. My business is called WhiteSpace not only because it’s one of the most elegant and often overlooked principles of great design, but because it’s also a very powerful and also often over looked tool for planning our day. Imagine … you’ve scheduled every minute of your day, you’ve booked your time with back to back appointments. You’ve got a bulging todo list. Someone is late, they didn’t send you the files you need or you go over time in a meeting. How do you feel about the rest of your day or week? Something a little margin can help fix. You may be surprised to know that the definition of priority is singular in focus. In the late 14th Century the word priority meant ‘the state of being earlier’, or’ the fact or condition of being prior’. Don’t you love old fashioned english! In todays’ terms we’d say it refers to ‘the most important thing’. It also interesting to note that the word priorities was almost nonexistent before 1940. 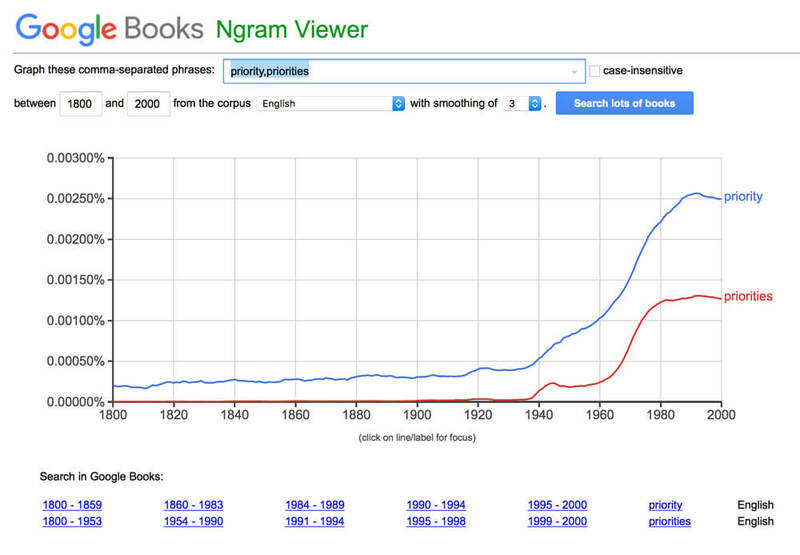 See these results from a Google Ngram search for priority and priorities. It would seem that our belief in being able to have more than one priority is causing us more harm that good. Maybe our ancestors knew something important we’ve lost sight of today. Maybe the idea of having multiple ‘most important things’ is a sign that we’re losing our ability to know what the most important things are. 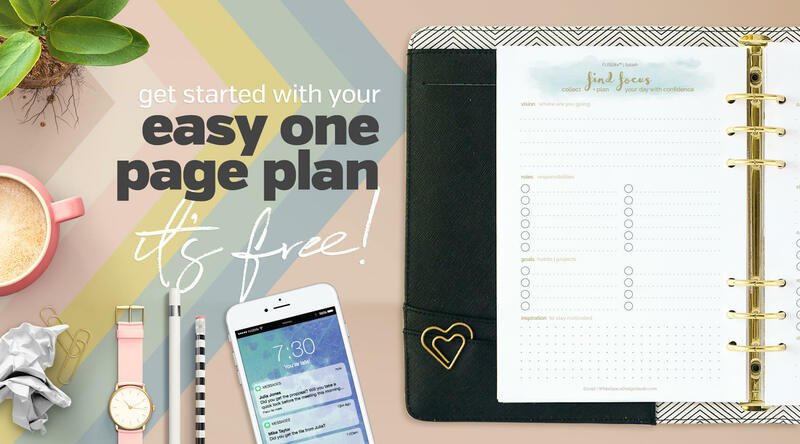 Looking at your planner ask yourself : What’s your priority today? Productivity is a converted aspiration today. If we could be more productive we could get more done. True. But I ask you why? Why do you want to get more done + faster? How would that make things better, more successful? I would say it doesn’t, not unless you are also efficient. That is, improving how you get things done. If we are only focusing on being productive, we are in danger of falling into the trap of getting more and more and more and more, you get the idea, done. Being efficient in how we get things done by default makes us more productive, but being more productive doesn’t necessarily make us more efficient. 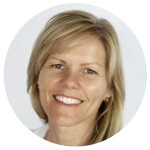 I would challenge you to look for ways that you can be more efficient, not just productive. This one seems weird right?! And yet it’s the key to more freedom, peace + joy in your business + life. I had no idea how little I really knew about myself. And while I have a whole lot more to learn, life’s one big exciting learning journey, what I have learnt has given me a confidence in who I am + how I can better serve others, than I would have ever have imagined possible. Getting to know myself has freed me from trying to make other people’s ways of doing things work for me. Ever tried fitting a square peg in a round hole? There is no one size fit’s all solution. That’s why no one planner will work for everyone. And sometimes it’s not the planner or tool that’s purely designed, it’s just that we don’t know ourselves enough to use it in a way that could helps us be our best. I contribute a good chunk of this growth + insight to my amazing friends and mentors who have helped me see what I couldn’t yet see. There is so much I want to share about this lesson, which I’ll do in an upcoming article, but for today I want to encourage you to make the time to learn more about who you are, why do you what you do, what your super powers are, that is your strengths + skills that make you unique. A good planner is the hub of a well planned day. Actually it’s not only a good planner but an amazing planning + organising system. They go hand in hand, like Tom and Jerry, Batman and Robin, Bert and Ernie. Well, you get the picture. I use to use the standard type diary when I first started my graphic design business. You know the kind that you can find at almost any office supply, supermarket and discount store. Depending on your planning needs they can get the job done. As a creative though, I like something more inspiring, like my Anne Geddes diary back in 90s, although it wasn’t terribly practical for planning. Thankfully planners have come a long way since then and I’m proud to be part of the revolution of daily planners, agendas and diarys that help organise our day. 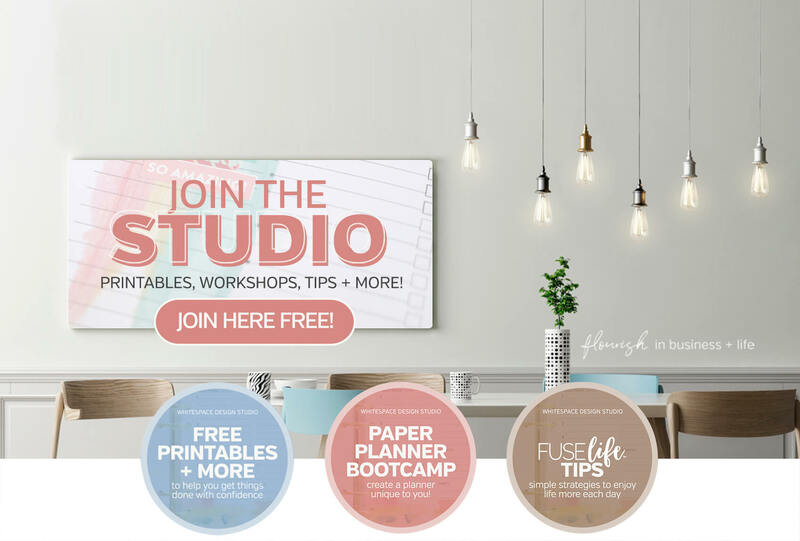 Over the past 5 years I’ve been designing planners + my own productivity system to help me organise my family + business, all the while home schooling our son. With all those things going on it’s so easy to lose focus. I also know it’s how you use your planner, there’s that efficiency thing again, that makes all the difference to your day. 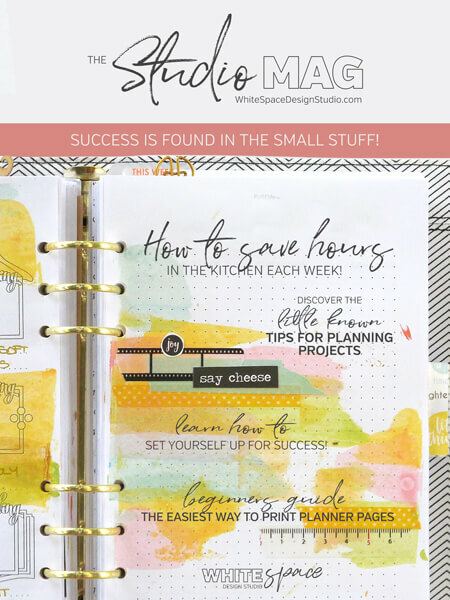 Last year I took the plunge and wrote my Planner Playbook. 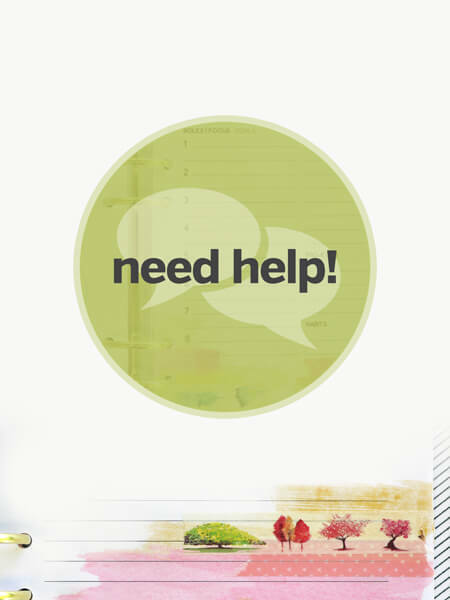 It’s a step by step planning + productivity system that helps you set goals and achieve them. What has surprised me the most out of all the systems, that is, processes, lists, workflows, habits and routines, the one thing that has moved the needle the most for me has been the reflection. Reflection in the form of daily journalling and reviews. 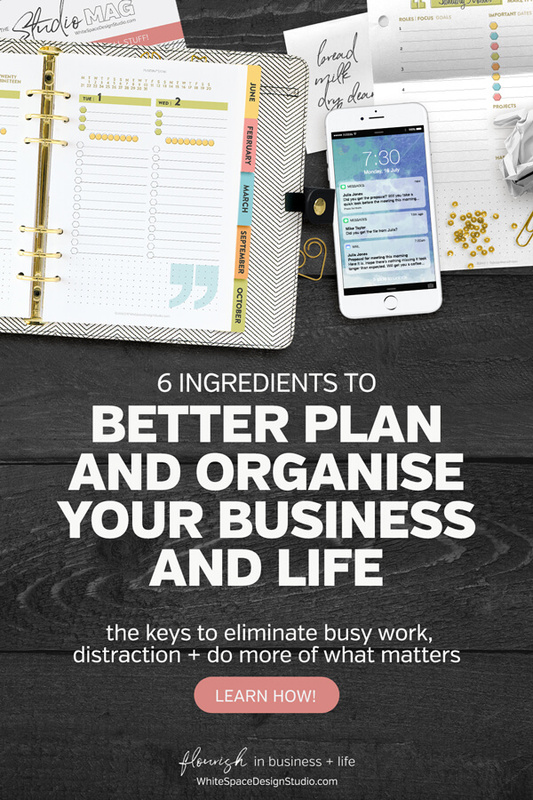 So now you know the 6 ingredients that I believe are essential to better planning + organising your business + life. Let me know in the comments below which of the 6 ingredients will you start applying today! Over the coming weeks I’ll be diving deeper into how you can make these ingredients part of the way you plan + organise your day. 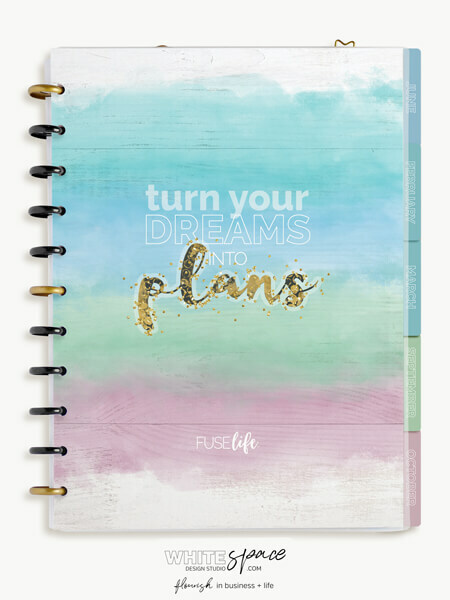 Grab a stylish planner in store and get ready to eliminate busy work, distraction and do more of what matters as we apply these six ingredients of success to our business + life.